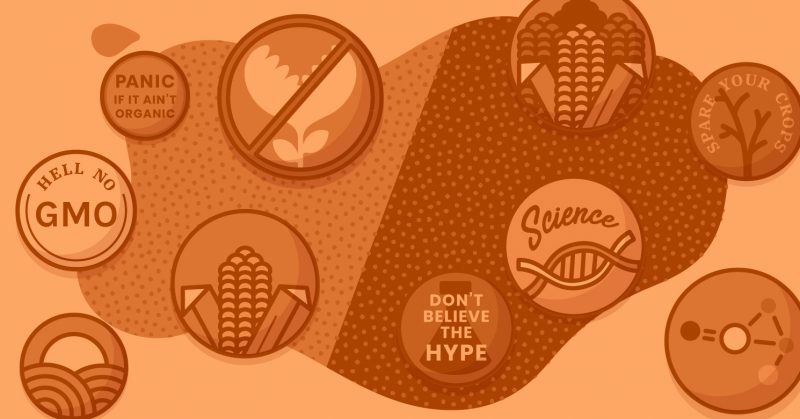 Some reputable resources say GMOs are completely safe; activists groups and other organizations say they are dangerous, citing fact spinning, hidden agendas, and incomplete reporting on the part of the GMO supporters. This article presents you with resources from both sides of the GMO debate: those that are pro GMO, and those that are anti GMO. When I Googled the question, “Where can I get my questions answered about GMOs?” the initial search results were largely pro-GMO. Is this because there are more pro-GMO articles written? Or do the sources have a better handle on SEO, and more funding options to support a greater online reach? Articles that are pro-GMO are from historically trusted, reliable sources such as the FDA and World Health Organization, and news outlets such as NBC News and Forbes. When I click on the pro-GMO article comments, many commenters are anti-GMO; pro-GMO commenters are not as vocal in the article comments. If there are so many reliable sources in the US that say GMOs are safe, why have 25 countries in the world — such as China, India, France, Germany, Russia, Italy and Mexico — have a total or partial ban on them? Is there something we are missing? I’ve noticed the trusted “Butterfly” label on many of the products I buy, which is the symbol of The Product Verification Program from the Non-GMO Project. Why is a label necessary if genetically modified products are safe? As with any controversial subject, you will want to understand both sides. Below I have listed resources for both pro and anti GMO websites, with a short summary of each and points to think about. Your own input and observations are welcome in the comments section below. A private, non-profit organization, the National Academy of Sciences (NAS) provides objective, science-based advice on critical issues facing the nation on matters related to science and technology. It was established by an Act of Congress, and was signed by President Abraham Lincoln in 1863. In May of 2016, they released a report entitled, “Genetically Engineered Crops Experiences and Prospects.” The report takes a comprehensive look at genetically engineered crops, and whether they are safe to eat, have any environmental or social impacts, or if they reduce the use of pesticides. You can download the 606-page PDF for free here, but if you want a summary of the reports findings, you can read an article from the National Geographic. While NAS has historically been known as a powerful, impartial scientific institution, it has received its share of conflicts of interest accusations on the GMO topic. Public interest advocates, scientists and other groups have documented that the NAS receives millions of dollars from companies like Monsanto, and they failed to disclose that authors of reports that largely gave GMOs a clean bill of health had ties to the industry. The Chronicle of Higher Education announced the NAS will be toughening their financial conflict of interest policies. GMO Answers is a website designed to answer questions about GMOs, what they are made of, how food is grown, and what the safety data says. There are articles, downloadables, infographics, and videos available to educate their readers on agriculture, the environment, business practices, pesticides, labeling, and much more. On their About page, they disclose that GMO Answers is funded by members of The Council for Biotechnology Information, which includes BASF, Bayer, Dow AgroSciences, DuPont, Monsanto Company and Syngenta. The 351 experts who answer consumer questions on GMO Answers are not paid to answer questions, but they are employed by the same companies that fund GMO Answers. They are broken down into three groups: independent experts, company experts and ambassador experts. You can search by type and also by company. The FDA regulates genetically engineered food just as it regulates all food, and its process is described on its website. It even created a Plant Biotechnology Consultation Program that works with genetically engineered plant developers to evaluate the safety of food from a new crop before it enters the market. They’ve evaluated over 150 GE plant varieties since 1994, but it’s interesting that the consultation program is voluntary. Another point to consider is that the FDA has a history of permitting advisors with financial ties to the food and drug industry to serve on advisory committees and influence their policies, as per a 2014 study published in Milbank Quarterly. In a 2016 article by the FDA, they acknowledge they have been working to bring greater transparency to how committee members’ financial interests are evaluated. They have also addressed “appearance issues,” or when a committee member who does not have financial interests but whose interests and relationships may create the appearance they lack impartiality. They have since published new draft guidance that describes their procedures for evaluating appearance issues. All of this information is good to keep in mind when reading GMO findings and recommendations published by the FDA. The World Health Organization was established on April 7, 1948 to provide global leadership in public health within the United Nations system. The WHO has a Frequently Asked Questions section on their website devoted to answering questions about genetically modified foods, why they were developed, its safety, and environmental concerns. Question number eight addresses the question, “Are GM foods safe?” to which they reply that individual GM food safety should be assessed on a case-by-case basis, and that general statements on the safety of all GM foods are not possible. The Non-GMO Project reserves and builds sources of non-GMO products, educates consumers, and provides verified non-GMO products and retailers. Its website explains their product verification process and provides a list of Non-GMO Project approved laboratories. Because of the number and complexity of ingredients in a given product, they charge a hefty fee for their verification but you can request an accurate and personalized estimate for your company. How did this company corner the market on GMO labeling? Are they exempt from corruption? How are they held accountable? The IRT’s tagline is “the most comprehensive source of GMO health information on the web” and while some of the resources are free, Mr. Smith is also selling books, a GMO speaker training program, and provides a list of speakers who have completed his training that you can pay to speak at your event. It’s hard to miss that the entire website is centered around one individual, with a lot of opportunities for him to make money. USRTK researches what is going on behind the scenes in the food industry. They believe in transparency, and stand up for the right to know what is in food and how it affects health. The website contains a whole page of GMO resources. This group is refreshingly transparent, even voluntarily listing their major donors and IRS filings on their website. GMWatch provides videos, articles, GM myths and even a “GM mythmakers” database of all of the people and groups behind the push for GM. Although their “GMWatch SpinProfiles” link is broken, there are still plenty of articles reporting on a GMO promoter’s personal life, such as abuse allegations, problems with alcohol, and other mudslinging allegations. While this may be mildly entertaining, it does cause one to consider the author’s motivations and if such personal attacks are necessary. Personally, I don’t put much stock in tabloids, and think this tactic is sleazy and hacky. Do you have an opinion on the use of GMOs in food? Please comment below and let’s get the conversation started!